NASA's new Transiting Exoplanet Survey Satellite (TESS) is designed to ferret out habitable exoplanets, but with hundreds of thousands of sunlike and smaller stars in its camera views, which of those stars could host planets like our own? A team of astronomers from Cornell, Lehigh and Vanderbilt universities has identified the most promising targets for this search in the new "TESS Habitable Zone Star Catalog," published in Astrophysical Journal Letters. Lead author is Lisa Kaltenegger, professor of astronomy and director of Cornell's Carl Sagan Institute and member of the TESS science team. This new catalog draws from one originally developed at Vanderbilt that contains hundreds of millions of stars. Using data from a number of sources, including Vanderbilt's KELT telescope and the star "flicker" analysis method pioneered at Vanderbilt, Stevenson Professor of Physics and Astronomy Keivan Stassun and his team have been working since 2012 to narrow down the field from 470 million stars visible to TESS to the 250,000 most likely to host a planet like our own. "Our ambition is to not only detect hundreds of Earth-like worlds in other solar systems, but to find them around our closest neighboring solar systems," Stassun said. "In a few years' time, we may very well know that there are other habitable planets out there, with breathable atmospheres. Of course, we won't yet know whether there is anything, or anyone, there breathing it. Still, this is a remarkable time in human history and a huge leap for our understanding of our place in the universe." "Life could exist on all sorts of worlds, but the kind we know can support life is our own, so it makes sense to first look for Earth-like planets," Kaltenegger said. "This catalog is important for TESS because anyone working with the data wants to know around which stars we can find the closest Earth-analogs." Kaltenegger leads a program on TESS that is observing the catalog's 1,823 stars in detail, looking for planets. "I have 408 new favorite stars," says Kaltenegger. "It is amazing that I don't have to pick just one; I now get to search hundreds of stars." The habitable zone is the area around a star at which water can be liquid on a rocky planet's surface, therefore considered ideal for sustaining life. As the researchers note, planets outside the habitable zone could certainly harbor life, but it would be extremely difficult to detect any signs of life on such frozen planets without flying there. The catalog also identifies a subset of 227 stars for which TESS can not only probe for planets that receive the same irradiation as Earth, but for which TESS can also probe out further, covering the full extent of the habitable zone all the way to cooler Mars-like orbits. This will allow astronomers to probe the diversity of potentially habitable worlds around hundreds of cool stars during the TESS mission's lifetime. "We don't know how many planets TESS will find around the hundreds of stars in our catalog or whether they will be habitable," Kaltenegger said, "but the odds are in our favor. Some studies indicate that there are many rocky planets in the habitable zone of cool stars, like the ones in our catalog. We're excited to see what worlds we'll find." A total of 137 stars in the catalog are within the continuous viewing zone of NASA's James Webb Space Telescope, now under construction. Webb will be able to observe them to characterize in-depth any planets found by TESS and search for signs of life in their atmospheres. "Our ambition is to not only detect hundreds of Earth-like worlds in other solar systems, but to find them around our closest neighboring solar systems," Stassun said. 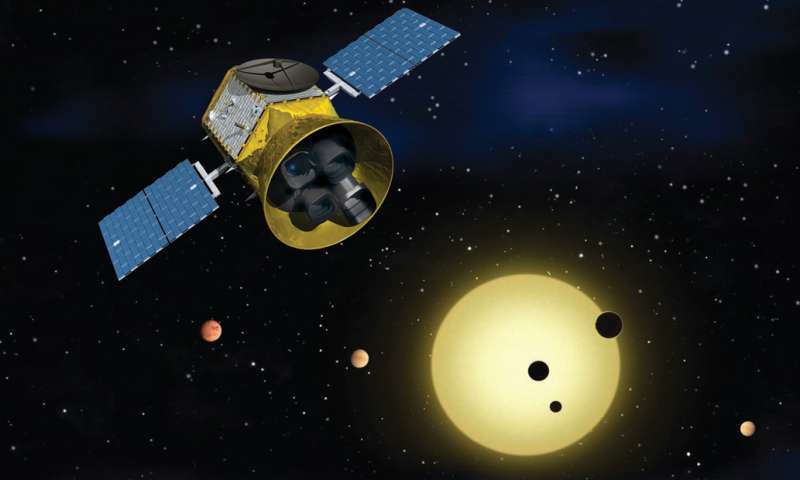 TESS is a truly amazing probe, but it was designed to work in conjunction with the James Webb Space Telescope (JWST) which was supposed to follow up on TESS discoveries. This is depressing & exciting news. Hopefully none of the confirmed Living Worlds will be within range of any possible contact. That those Alien Biospheres & eventually, possible sophonts will survive long after we have destroyed ourselves & murdered our World. & it will be murder, most foul! But at least the deniers will will perish clutching their 24 pieces of silver. Cause, isn't being the wealthiest corpse a sign of superiority? While, in their spite, If they cannot live forever in luxury? Kill all the rest of humanity & every biological creature. Just to show us all whose Boss! Optimism is a psychotic break from Reality. rrwillsj, if we continue destroying Earth the way we are now, we will not be around long enough to reach any exoplanets. At best, a relatively small number of humans will cling to existence here and on Mars. As these people struggle just to stay alive, I suspect they will develop an appreciation of the value of a living environment far more than we have. Heck, maybe they won't elect leaders that assert the Global Warming is a Chinese Hoax. Even if we somehow reach the stars with all our bad habits intact and start destroying other worlds like we are currently destroying our own, I suspect the non-interference from aliens we are currently enjoying may not go on forever. Stated another way, sooner or later destroying every planet we can reach may ultimately be a very bad idea. Put the shoe on the other foot. Suppose we are the highly advanced species watching a nascent Borg-like species destroy everything they touch. How would we react? So now we debate if the Borg have any more or less right to existence than we do? Perhaps the Borg are protecting pre-sophonts by destroying those worlds manifesting the technology as well as the psychology of conquest & extermination? Claiming the Right to dictate what is Right for others? Is not the same as actually having the Right to decide for others what is Right for them. Cause, uhh, self-serving are we? You obviously did not watch the show or watch it closely enough. The Borg enslave all "sophonts" for their own selfish purposes and take their technology, planets, etc. They are a menace. rrwillsj: "Hopefully none of the confirmed Living Worlds will be within range of any possible contact." Mark: (Essentially) Destroying worlds is a bad idea for many reasons. rrwillsj: There is is a bright side to destroying intelligent races. Mark: Your statements appear to be in conflict. My position is unchanged, i.e., destroying worlds is a bad idea for many reasons, even if one completely lacks any integrity whatsoever.